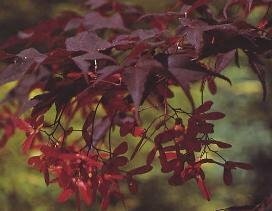 "Bloodgood" is the most popular large-leaved, upright grower in the Japanese Maple Family. Very good deep red or black red. Very hardy maple grows to 10 meters. Great in higher temps, or high humidity. Grows in zones: 4 - 9.